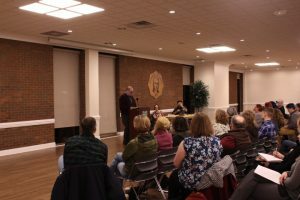 The A. E. Stringer Visiting Writers Series events, coordinated by Dr. Cody Lumpkin and John Van Kirk, are sponsored by the Department of English, the College of Liberal Arts, and the West Virginia Humanities Council. Each event is free and open to the public. Click on the links below to read stories or find additional information regarding past events. 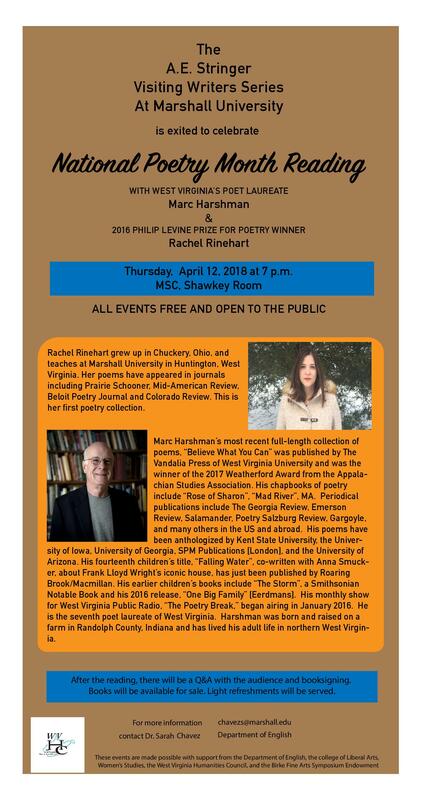 In honor of National Poetry month, we invite you to join us for a special reading with West Virginia Poet Laureate Marc Harshman and 2016 Philip Levine Prize winner, and MU English faculty member, Rachel Rinehart! Q&A and book signing to follow. Thursday at 7 p.m. in the Shawkey Room, Memorial Student Center. 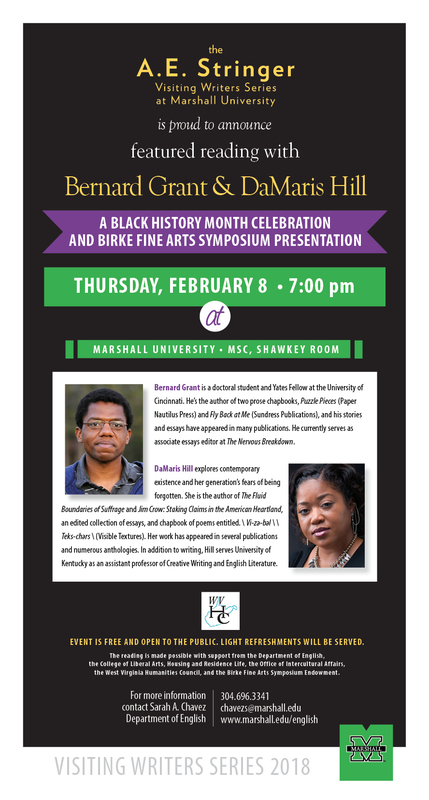 In a celebration of Black History month, in conjunction with the Marshall University Birke Fine Arts Symposium, we present authors Bernard Grant and DaMaris Hill for a reading of their work. Join us this Thursday, at 7 p.m. in the Shawkey Room, Memorial Student Center. The A.E Stringer Visiting Writers Series is focusing the spring 2018 semester on exhibiting writers from diverse backgrounds. 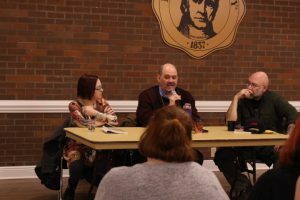 Our first event, last Thursday January 25th, was a Queer Appalachian reading showcasing the work of Appalachian native writers Julia Watts, Jeff Mann and Okey Napier. 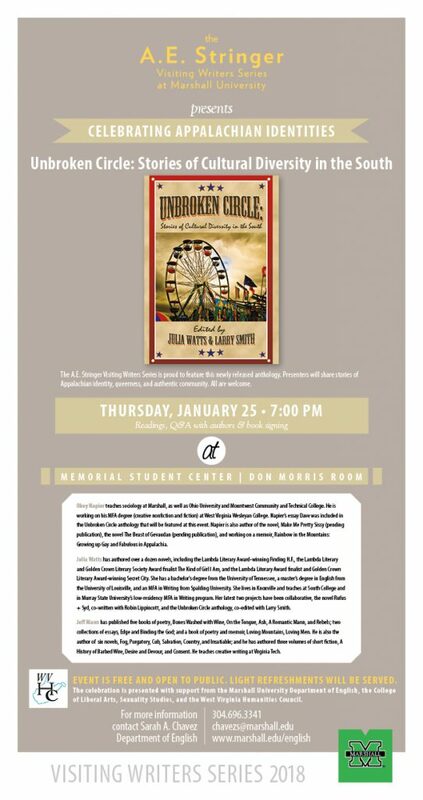 Watts is an editor of the anthology Unbroken Circle: Stories of Cultural Diversity in the South and Napier and Mann both have personal essays included in it. 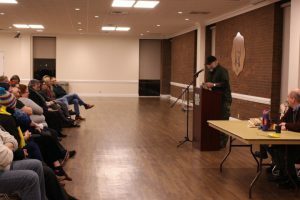 The reading brought about 80 attendees which included students, faculty, and community members. The first reader was Julia Watts. Julia Watts is the author of over a dozen novels and a Lambda Literary Award winner. 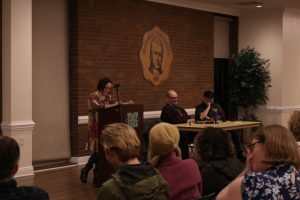 We had a special opportunity to hear her read from an upcoming, currently untitled LGBTQ Appalachian anthology of fiction and poetry that both she and Jeff Mann are collaborating on. She selected to read the short story “Handling Dynamite” from the anthology. “Handling Dynamite” centered around an LGBTQ character living in secrecy in rural Appalachia while working in the coalmines. The story stayed true to the “down home” and familiar Appalachian fashion while shedding light on the experience of handling both queer and southern identities. Our second reader of the night was Okey Napier. Napier is the author of two pending novels and teaches sociology at Marshall University, Ohio University and Mountwest Community and Technical College. He read from his creative non-fiction essay “Dave” set in Huntington, West Virginia, about Napier’s experiences befriending a drag queen named Dave who suffered from HIV. It’s tear-jerking and at times humorous reflections reveal the unique struggles and personalities within the Appalachian LGBTQ community. To close off the reading, Lambda Literary Award winner Jeff Mann took the podium to read his essay “Big Queer Convocations,” also featured in the Unbroken Circle anthology. The essay swells with pride in his roots while honestly confronting the dissonance of being both gay and Appalachian. In spite of the many political and cultural differences that shroud the gap between both communities, Mann’s essay imparts the message that one can embrace both identities and create their own safe haven in their southern homelands. A productive and thought-provoking Q&A finished off the reading for the night. Politics, advice on family and reflections on the degree of exposure that the internet has allowed the queer community were all topics of conversation. Many members of the audience stayed after for further discussion and book signing with the authors. By the end of the night the table that contained for-sale copies of Unbroken Circle: Stories of Cultural Diversity in the South was empty. This event was the product of collaboration between many individuals and organizations. We would like to thank the authors for their time and graciousness and The West Virginia Humanities Council for their sponsorship.